‘Hunt for the Wilderpeople’ is a film from New Zealand with a funny, deeply affecting message. Raised on hip-hop and foster care, defiant city kid Ricky gets a fresh start in the New Zealand countryside. He quickly finds himself at home with his new foster family, the loving Aunt Bella, the cantankerous Uncle Hec and dog Tupac. When a tragedy strikes that threatens to ship Ricky to another home, both he and Hec go on the run in the bush. As a national manhunt ensues, the newly branded outlaws must face their options: go out in a blaze of glory or overcome their differences and survive as a family. Equal parts road comedy and rousing adventure story, ‘Hunt for the Wilderpeople’ masterfully weaves lively humour with emotionally honest performances by Sam Neill and Julian Dennison. 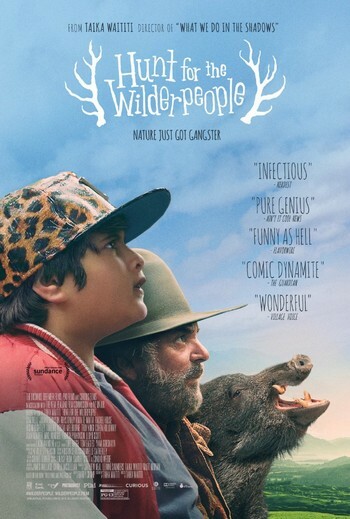 A hilarious, touching crowd-pleaser, ‘Hunt for the Wilderpeople’ reminds us about the journey that growing up is and those who help us along the way. ‘Hunt for the Wilderpeople’ will be screened on Friday 13 April at the Jubilee Hall, Slade Road, Portishead. The film starts at 8.00pm (with refreshments available from 7.30) and tickets cost £5.00. All are most welcome.